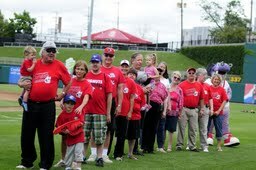 Below are a couple pictures that were taken on Monday Sept. 2nd before the final Lugnuts game of the season. These are the friendly faces behind the booster club that helps out the players and coach's all season long! We would like to thank the Lansing Lugnuts for their continued help and support! 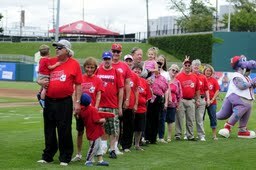 Booster Members Line Up on the field, Gina Patton giving Dan Hills Bunny ears! More serious picture of the Booster Club....and Big Lug! I would like to thank everyone for their hard work this season! We had some of the best turn outs in a long time for our dinners. Once I get a copy of the 2014 schedule, I will be putting the *tentative* calendar together for our events for 2014. I am in contact with some other booster clubs in our league and trying to get a few new ideas that we can try to do for 2014. Hopefully I will hear from them all soon. To my shock, the WhiteCaps do NOT have a booster club. For the October meeting we will go over the schedule that I will be putting together so we can have some feedback. We will need to plan the golf outing this offseason so we can get sponsors and prizes. We will be shooting for May or June, depending on the schedule. Our next meeting will be Thurs 9/12 at Buddies in Holt at 6:30. I want to get a vote to see if we would like to have our October meeting there as well. I believe we will be voting on officers at the meeting. Before you know it, it will be March and we will be having our spring training warm up dinner and planning our welcome bags and first dinner with the team! Hope to see you all at the meeting on Thursday! Pictures from golf and last dinner will be posted soon!